Despite my love for white wines, I have some issues with white Burgundies. I've run into my fair share of disappointments, which has to do, for the most part, with specimens that did not age as well as advertised. For that reason, I've been buying about three bottles of Chablis for every equivalent bottle from the Cote. I'm mad in love with Chablis! The Chablis acidity keeps those lovelies lively and they show better young, so they're a good drop at almost any age. Plus, that marine thing they have going makes them so appealing to me. 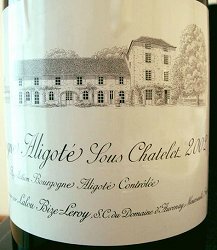 About a year ago, Daniel Lifshtiz and Zacki Rosenblum put together a Burgundy tasting group. A short while afterwards, Zacki had twins and Daniel took the job over completely. We meet together every few weeks for light fare and bigger wines - and lotsa fun. It's a great group and it's about time I thanked the two founding fathers for their enterprise and Daniel for his consistent hustle. The latest tasting that Daniel Lifshitz came up with chimed in with a few duds, but offered enough lovely examples to renew my faith. It also convinced there are quite a few wines in my fridge I'd better open sooner than later. Obviously Aligote. Citrus and flint. I adore the reserved, light touch on the palate. WineRoute, not sure about the price. The first question I asked myself was, is it reductive or just unpleasantly over the hill? With this stewed, cooked - the proper adjectives allude me - one-dimensional brine, the right answer is moot. Didn't catch the name of the importer, or the price. This is very disjointed right now. The oak makes it smell a little like an air freshener, while the palate is better, with solid acidity. After ten minutes, I like more, as it becomes an unobstrusive food pairing. Although for the price of Puligny-Montrachet, that's something of an under-achievement. A complex, stinky nose, minerals, dry grass. A foursquare attack, but in its wake is lots of depth and a streak of acidity. Very tasty. Amazing how well this exciting wine has aged. Burgundy Wine Collection. 220 NIS at the time (I still remember very well), 290 NIS now, and considering the quality is on par with a Premier Cru, a fair price. It kills me to say it about Leroy, but there it is. A subtle and complex nose, vibrant yet restrained on the palate. This isn't a wine designed to knock you out but rather to convince you of its purity and its ability to communicate its origins. As you can see, my ardor for Chablis is well earned! Burgundy Wine Collection again. This costs 420 NIS these days, but I still remember when it sold for 270. 350 NIS worth of DOA, courtesy of Burgundy Wine Collection. Stewed apple cider, with honey on top. The palate is lively, if too sweet and fat. I think this is the style of the winemaker, unlike the case with the previous wine, which can't be held accountable for being dead. WineRoute, this cost about 250, 300 NIS. Kids, don't try this at home: This bottle was opened at ten in the morning of the tasting! This, at last, is what I look for in whites from the Cote: minerals, dry grass, roasted nuts. The palate is vibrant and detailed and very filling without excessive fat. WineRoute again, this is a 500-600 NIS wine. Very self assured and more restrained than the former wine, and less of a show off. A nutty, intellectual finish. Burgundy Wine Collection for the final time. This usually costs in the neighborhood of 350 NIS. A ripe nose that grows minerally in a somewhat idiosyncratic way (a bit of sculptor clay and a bit of flint). Balanced and tasty on the palate, and, although it leans towards tropical ripeness, that's not enough to dent its balance, nor distract from its breed. A less worthy Grand Cru this is. It has some tropical fruit on the nose, which it balances with some minerals, but, overall, it's too perfumed for me. The palate is too sweet and ripe. And too creamy.